Autumn 2014 saw the revival of a distinctive tradition of anthology-making with its roots in Edinburgh’s history. 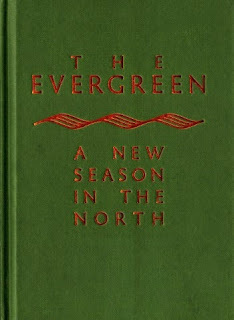 The Evergreen: A New Season in the North is the first publication of The Word Bank, a community publishing collective run by Edinburgh Old Town Development Trust. Founded by residents of Edinburgh’s Old Town, the Trust brings members of the local community together to shape the development of the Old Town in ways that meet the community’s needs and sustain its future growth. Protection of Edinburgh Old Town’s historic environment and cultural heritage is matched with support for education, contemporary arts, and the development of green spaces within this densely-built area. The Word Bank’s Evergreen contributes to the Trust’s central aims as the first of four projected volumes whose contents — poetry, short stories, essays, and visual art — explore the part the arts play in making the places in which we live. The new Evergreen connects with the Old Town’s past, and a tradition that finds its origins in a remarkable collection of poetry in English and Scots compiled by a man in his early twenties four-and-a-half centuries ago. George Bannatyne was the son of an Edinburgh burgess with a home in the Cowgate; his manuscript, completed in 1568, is the single largest surviving vernacular anthology from early modern Scotland. Now housed in the National Library of Scotland, the Bannatyne Manuscript reflects the milieu of its production: poets within its pages like Alexander Scott and John Bellenden were part of the Bannatynes’ social network, while Bannatyne’s father James makes a cameo appearance in a poem by Robert Sempill. Bannatyne’s book is more than a reflection of the context of its own production, however: Bannatyne frames his book as a collection of pieces whose truth has stood the test of time, and in doing so stakes a place for himself in contemporary society by virtue of his role in transmitting the values and tastes at the heart of his urban community. Bannatyne’s Manuscript fell into the hands of the poet Allan Ramsay in 1718, with far-reaching consequences for the development of his writing, and for Scottish literature. Ramsay had found early inspiration in the comic medieval poem ‘Christis Kirk of the Green’; in the Bannatyne Manuscript, he found a rich source of material that helped him to shape a new poetic voice for Scots poetry, one capable of supporting the rhythms of his own natural speech. Ramsay’s creative response to literary tradition is also marked in his role as editor: in 1724, he published two volumes gathered from the manuscript as The Ever Green, a title signalling his desire to identify these poems as part of an enduring Scottish tradition to rival the Classics. Ramsay’s careful selections, and the introduction of a few of his own poems playfully disguised as Older Scots originals, enabled him to construct an image of the past as the site of a popular literary culture where the lives of labouring people found representation. Ramsay’s Ever Green maps out an imaginative territory that he, and poets like him, might cultivate. If Bannatyne and Ramsay make creative use of the past to establish a space where new growth might take hold, for the urban planner, biologist and sociologist Patrick Geddes, the Evergreen tradition makes the connection between cultural history, civic regeneration, and life in its broadest sense, explicit. In the 1890s, Geddes’ redevelopment of Allan Ramsay’s former home at the top of the Royal Mile as a place that might revitalise the dilapidated Old Town brought students, lecturers, artisans, and other professionals back into the heart of the city to live together. The naming of the development as Ramsay Gardens foreshadows Geddes’ later commitment to green space as essential to development that contributes to the real wealth of a city and its inhabitants, rather than the high-density expansion that serves economic profit above all else. As Geddes argues, ‘Towns must now cease to spread like expanding ink-stains and grease spots: once in true development, they will repeat the star-like opening of the flower, with green leaves set in alternation with its golden rays’.1 In his later involvement with the Outlook Tower Open Spaces Committee, Geddes was part of a wider movement that established children’s gardens in the Old Town, using them as educational spaces or open-air schools serving children’s need for practical learning and access to nature. In publishing a new Evergreen in the twenty-first century, Edinburgh Old Town Development Trust establishes a resonant connection to the urban past that is in profound sympathy with their own commitment to community-led development. Robin Gillanders’ ‘Portraits’ of Old Town inhabitants combine words and images, amplifying their voices and those of the organisations with which they are involved. Kate Downie’s vibrant artwork offers a contemporary vision of the city — ‘Old Town New Story’ — in a conversation about Edinburgh past and present echoed and extended in the poems of our current makar, Christine De Luca, and others, from Alan Gillis to Peter Kravitz, David Herd, and Samantha Walton. In the stories of James Robertson, Todd McEwen, and Leila Aboulela, we find other narratives of the experience of urban life, while David Tomassini’s ‘Letter from Venice’ offers an international perspective on the ongoing struggle between market forces, global recession, tourism, and the desire to preserve a historic city as a place where residents can live, forging a sustainable future. These are just a few of the diverse pieces to be found in a collection linked by its focus on he role of the arts in mediating our experience of the places in which we live, and its potential to transform them. An ongoing series of events generously funded by the Royal Society of Edinburgh is shaping the development of the conversation around the next instalments of the Evergreen. This spring, public lectures from Professor Tim Ingold and Edward Hollis have argued for the radical possibilities opened up by changing our perceptions of the city: in asking ‘what if the city were an ocean, and its buildings ships?’, Ingold exposes the ephemerality of the city, and the work of construction as a dynamic process of interaction with the complex specificity of our environments. Edward Hollis draws attention to the transformative effects of narrative presentation: models and animations used to publicise new developments are stories that seek to shape the future city, fictions whose assertion of their own substance obscures the finite duration of even the most solid of human constructions. The difference that marks our interventions in the fabric of our environment, from a flashmob momentarily blocking a street to a five-hundred-year-old house, is one of time. Like the Patrick Geddes Gardening Club, in giving shape to the community’s ongoing stories, the Evergreen claims a space for growth towards a sustainable future. Patrick Geddes, Cities in Evolution: An Introduction to the Town Planning Movement and to the Study of Civics (London: Williams & Norgate, 1915), p.97. Patrick Geddes, ‘The Evergreen’, in Good Reading about Many Books Mostly by their Authors. Second Year (London: Fisher Unwin, 1895-6), pp.253-64 (257). Patrick Geddes, ‘The Scots Renascence’, The Evergreen: A Northern Seasonal. Spring. (Edinburgh: Patrick Geddes & Associates, 1895), pp.131-139 (137). Catriona Grant, quoted in Jean Bareham, Hidden Gardens of the Royal Mile: Unexpected Green Gems in Edinburgh’s Old Town (Musselburgh: Greenyonder Tours, 2011), pp.105-106.